SINGAPORE — The U.S. Air Force’s light-attack aircraft has been envisioned as a cost-effective plane that would be at home targeting terrorists in the Middle East and North Africa, but the service’s top general wants to get Asian countries on board with the proposed program, he said Tuesday. The Air Force on Friday announced its decision to move forward with a light-attack experiment. A series of demonstrations of the Textron AT-6 Wolverine and Embraer-Sierra Nevada Corp. A-29 Super Tucano are planned for this summer, and a rapid acquisition program will likely follow. Read more from Singapore Airshow 2018 here! Increasing interoperability is seen by the service as one of the major benefits of a light-attack program, which would give the United States an avenue to purchase the same aircraft as some partner nations that might otherwise be unable to afford a pricier asset like an F-35 or F-15. During the first set of light attack experiments at Holloman Air Force Base last year, five countries observed the demonstrations. No countries from the Indo-Pacific regions were present even though terrorism is becoming more of a threat there. The Islamic State group continues to expand into Southeast Asian countries such as the Philippines. However, the Air Force has indicated it would like to see wider participation as experiments continue, something Goldfein himself echoed in his comments Tuesday. “The real big idea is that this is a fight that nations are engaged in all the way from the Philippines, in their very recent, very successful campaign in Marawi, to Nigeria and everywhere in between,” he said. Despite the demonstration being canceled, an eventual program of record has become the assumed outcome of further experimentation planned for two turboprop planes. But the focus cannot simply be on the platform, sensors and weapons, he said. “Across the region here in Southeast Asia and the Indo-Pacific region, I think there’s huge opportunities to look at this particular idea of not only a platform-sensor-weapon combination, but perhaps as important, an information sharing network that allows us to bring violence to a point where local governance can manage it. So that’s the big idea going forward with light attack, and so we’re eager to have international partners join us on that,” the officer said. 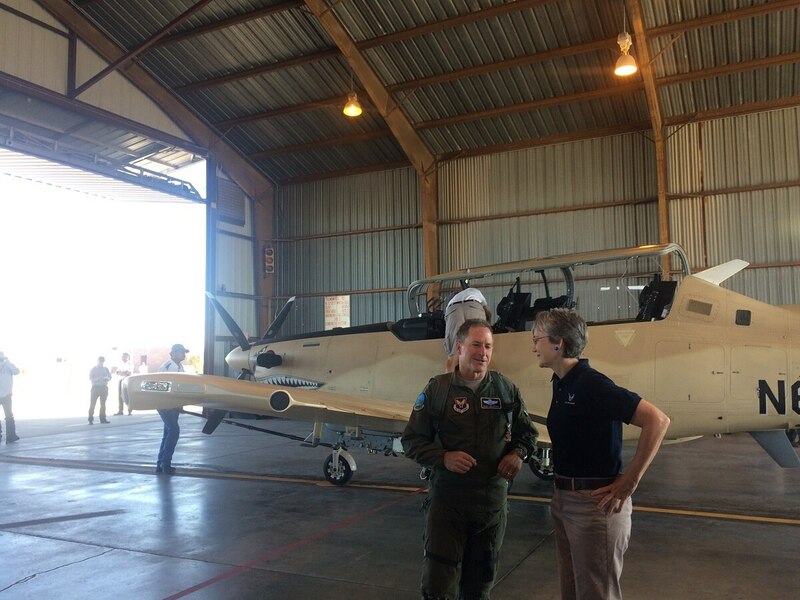 Building an “exportable, affordable network” that can “enable aircraft to communicate with joint and multinational forces, as well as command-and-control nodes” is one of the major goals of the follow-on experiments planned for the A-29 and AT-6, the Air Force stated last week. Those demonstrations will occur May to July 2018 at Davis-Monthan Air Force Base in Arizona. Although service leaders are looking favorably upon a potential light-attack airplane program, it’s still uncertain how the aircraft would be phased into the budget or what would be cut to pay for it. When asked whether the fiscal 2019 budget — which is slated to be released next week — would contain funding to begin buying light-attack aircraft, Goldfein declined to comment. Goldfein is set to attend the Singapore Airshow through Tuesday, following trips to South Korea and India earlier this month. He sat down with his counterpart in the Republic of Singapore Air Force, Maj. Gen. Mervyn Tan, during a set of discussions Monday. Much of the talks centered around the new U.S. national security and defense strategies released by the Trump administration over the past several weeks, Goldfein said.